Silver spot prices followed gold higher yesterday, ending the trading session with a wide spread up bar which closed back above all three moving averages once again, and confirmed the small hammer candle of Friday which suggested that the reversal was indeed short term. 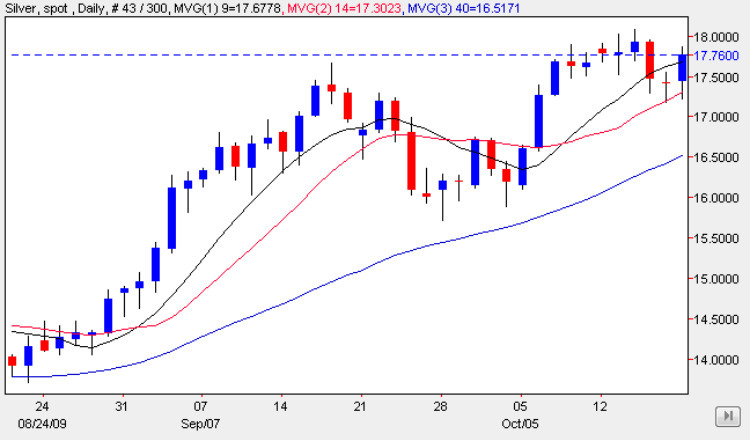 With yesterday’s candle finding good support from the 14 day moving average, and with gold prices looking to break into new high ground, the signals for spot silver are all positive at present and our initial target for the industrial commodity remains a break and hold above the $18.50 price handle. Should this be achieved in the short term, as seems likely, then this will signal a strong bullish move as we break above the resistance in the region which will then provide a solid platform for the upwards trend.